A SONIC drill is more precisely identified as a rotary vibratory drill. It is capable of high drilling speeds as well as accomplishing tasks, such as continuous coring that cannot be carried out by any other equipment. At first glance, a SONIC drill rig looks very much like a conventional air or mud rotary drill rig. The biggest difference is in the drill head, which is slightly larger than a standard rotary head. The head contains the mechanism necessary for rotary motion, as well as an oscillator, which causes a high frequency force to be superimposed on the drill string. The drill bit is physically vibrating up and down in addition to being pushed down and rotated. These three combined forces allow drilling -to proceed rapidly through most geological formations including most types of rock. In overburden, the vibratory action causes the surrounding soil particles to fluidize, thereby allowing effortless penetration. In rock, the drill bit causes fractures at the rock face, creating rock dust and small rock particles, which facilitates advancement of the drill bit. In many instances the drilling and coring of rock and earth can be accomplished without the use of any drilling fluid whatsoever. 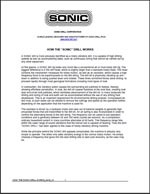 This is an important requirement for environmental drilling projects. Compressed air, drill mud, or plain water can be utilized to remove the cuttings and speed up the operation further, depending on the application that the machine is used for. The oscillator is driven by a hydraulic motor and uses out of balance weights to generate high sinusoidal forces that are transmitted to the drill bit. An air spring is also incorporated in order to confine the alternating forces to the drill string. The frequency can be varied to suit operation conditions and is generally between 50 and 160 hertz (cycles per second). As a comparison, ordinary household current in many countries alternates at 60 hertz. This frequency range falls within the lower range of sound vibrations that the human ear is capable of hearing. Thus the term "SONIC DRILL" has been applied to this class of rotary-vibratory drilling machine. 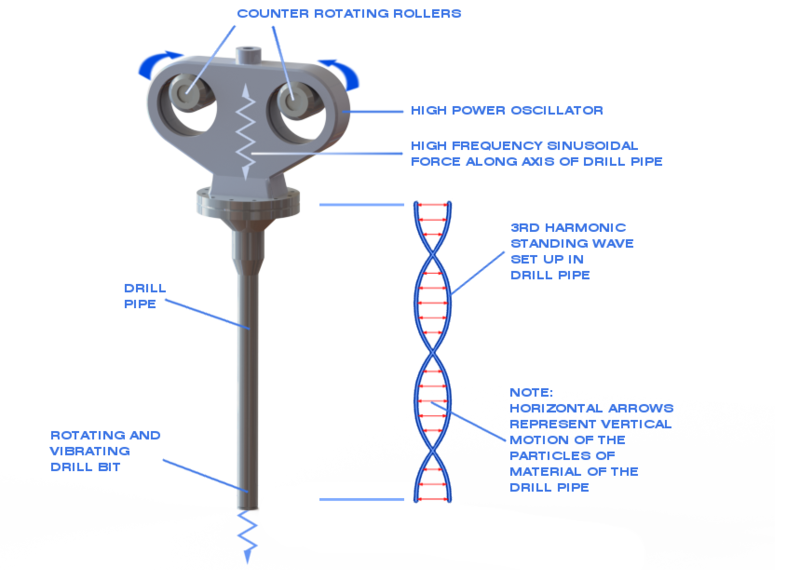 While the principle behind the SONIC drill appears complicated, the machine is actually very simple to operate. The driller only adds vibratory energy to the normal rotary motion. 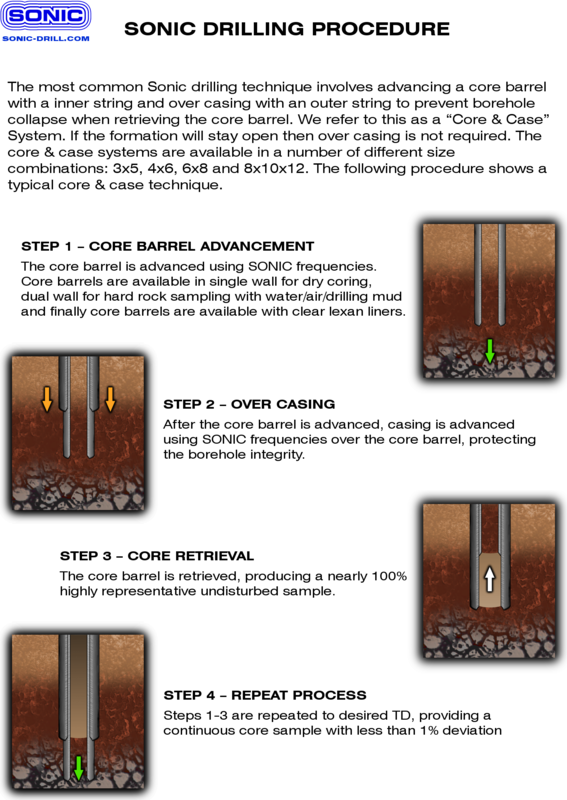 He simply chooses a frequency that gives him the best drilling rate or best core recovery, as the case may be.